Here I will try to describe the creative process of making the sleeve(s) for Michiel's/Nukove Records Benelux 12"/CD single release of 'Love Me Madly?'. When Michiel approached me with the idea, I was of course very ecstatic and happy. We discussed the possibilites, and we both agreed on that it had to look like a follow-up to the 'All I Ever Wanted' single. Michiel suggested live photos, but both live photos and promo photos can cause trouble with both accept from the band and copyright issues. I already had the template (done in CorelDraw 10), as I did a sleeve (for myself) of the promotional single 'You'll Be Sorry'. But this time it had to be perfect, so alot of measuring and scaling was done. Secondly the League logo had to be re-done, as I found very small errors in the one I did earlier. Looking at a perfect template, made me play around with the colours. The AIEW single has a vague fading of colours, which I also had to reproduce. I did 15 colouring tests (1), which was totally stupid, as I couldn't decide on colour, before I had images to go by. 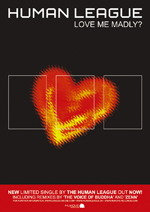 How do you graphically describe love, without a heart?. 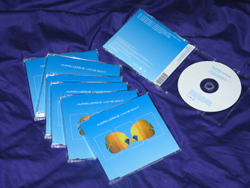 It was my first idea, and I skipped through many high resolution images in my CD collection, without finding one I liked. As I have earlier done some freehand drawing, I was about to do one on paper, and then scan it, but I thought I was gonna give the airbrush tool in Photoshop, a try first - a tool I have never used before. It turned out well (2), but was still lacking the frantic nature of the song. I listend to the track over and over, and read the lyrics. I then decided to make three hearts - a "love me well" heart, a "love me badly" heart, and finally a "love me madly" heart. I placed them in the boxes in that order (3). 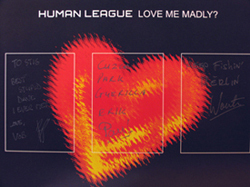 The "madly" heart was the original heart, with added yellow and some Photoshop effects, to give it a more frantic look, and it really dominated, so it got it's own sleeve - this one ended up as 12" sleeve (4). This was tricky. 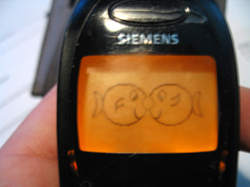 I wanted a arty image of a kissing couple. Again I looked through a dozen of images, but no one were good enough. Then I came up with the desperate idea of asking my wife to do some kissing with me, while trying taking the image myself at the same time - NOT EASY!. I had around 10 images, and I was giving them all the Photoshop treatment to get the arty image I wanted. It was a balance between making it obvious what was happening in the photo, but also hide me as much as possible! Only two came out as I wanted (5). To celebrate the forthcoming release, me and Michiel made a small promotional website (8). I've uploaded it again, so click on the image --> right, and a pop-up window should emerge. Other than that, I made a bunch of poster suggestions - of which fan forum board members could choose between 8 different layouts - of course Michiel had veto, but we ended up with a combination of two of them. (9). 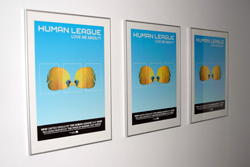 2 different posters were produced in size 100 x 70 cm. At "judgement day", I didn't knew Michiel was going to release both a CD and a 12", and there was no hesitation to his choices. I actually did the fishes, without knowing that he enjoys diving - a stroke of luck, which also made the Nukove logo pretty much easy to do. 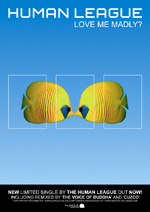 It's the same fish, but ray-traced to an out-line image, which can be scaled and coloured any which way you want. 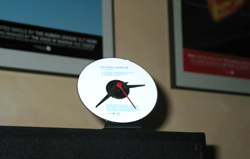 Michiel van Bokhorst made a clock for himself of the CD!